The Package includes both the Magazine and Audio Tracks. It is available in both hard copy and digital download editions. Order the digital download and save $5.00! This Back Issue Package includes 4 of our special Guitar Style issues. 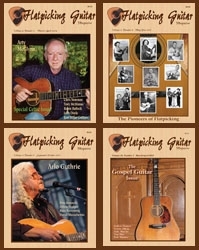 This includes our Celtic Guitar Issue, our Pioneers of Flatpicking Issue, our Folk Music Issue, and our Gospel Guitar Issue.